This kit includes everything needed to service all three fluids on your Harley-Davidson M8 motorcycle. 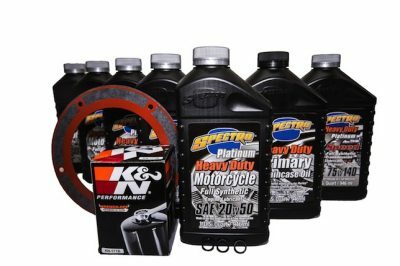 The Spectro Oil Harley Davidson Total Oil Change Kit has been put together specifically for your big twin Harley Davidson. 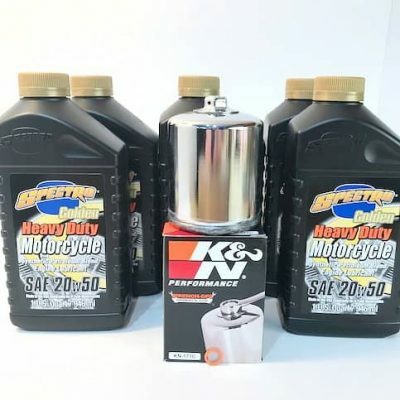 This kit comes with the full synthetic 20W-50, full synthetic Speed 6 gear oil, and one quart of Primary fluid. 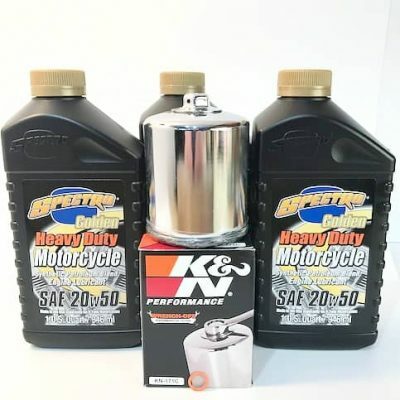 For the heart of your bike, Spectro’s Heavy Duty Platinum Full Synthetic is engineered specifically for Harley® high-performance engines and other high-output V-Twin motors. Spectro Heavy Duty Platinum Full Synthetic provides smoother shifting, reduces friction, offers tremendous lubrication and provides superior protection in extreme heat conditions. A.P.I. SF/SG – Diesel-rated. Lastly, the primary chain case is treated with Spectro’s Primary Chain Case Oil. This sheer stable petroleum is designed to withstand the punishment of high loads, and contains special polymers to provide exceptional clutch engagement and temperature stability. Meets full OEM requirements, and should be used according to manufacturer’s instructions. Formulated specifically for Harley® Sportster and Big Twin applications. Low drag, low friction loss SAE 85w viscosity eliminates clutch “drag” and slipping. 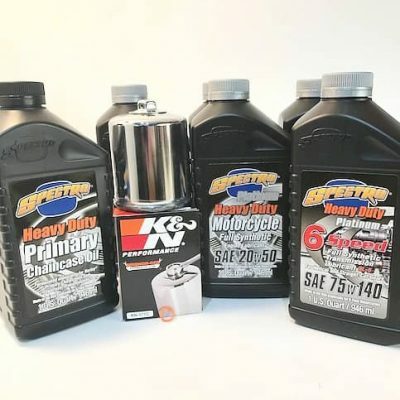 Visit the official Spectro Oils website here.